Set of 23 wooden alphabet blocks with impressed and printed letters and images. Each block has two opposite sides with either a raised capital letter or/and a raised image, two sides with a black printed number and/or capital letter, and two sides adhered with printed paper images. 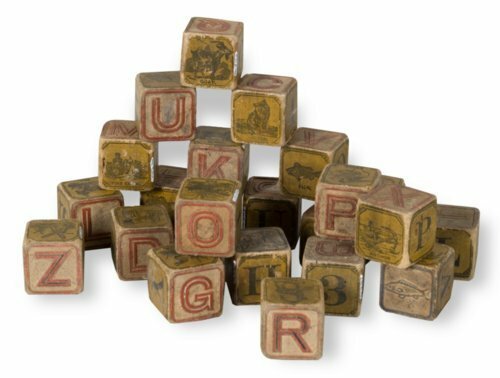 Mary Patterson Hambleton first used these blocks as a child in the Concordia, Kansas area, ca. 1890. Later, her son Philip Hambleton played with them in Topeka, using them as toy freight on his electric trains, ca. 1920-1925.